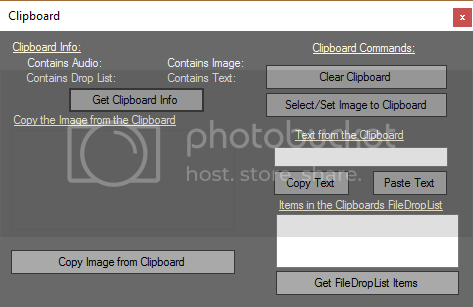 The clipboard is a software facility used for short-term data storage and/or data transfer between documents or applications, via copy and paste operations. It is most commonly a part of a GUI environment and is usually implemented as an anonymous, temporary data buffer, sometimes called the paste buffer, that can be accessed from most or all programs within the environment via defined programming interfaces. This is a basic example of using the .Net frameworks builtin Clipboard object to copy and paste various data type's from your application. openDLG.Filter = "Image Files (*.bmp, *.gif, *.jpg)|*.bmp;*.gif;*.jpg"